Cone Peak lies south of Big Sur in the Santa Lucia Mountain Range. 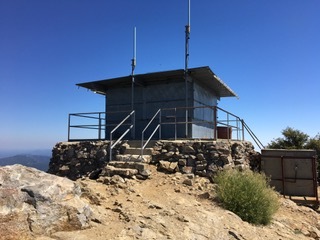 At 5,155 feet elevation, and sitting just three miles from the coastline, Cone Peak has the steepest elevation gain (33% gradient) of any mountain within three miles of the coast in all of the lower 48 states.Lookouts and visitors feel this gradient when they make the steep 2-mile hike on a narrow, rocky trail to the tower. Not much historical data is known about this one-story facility mounted on a stone foundation. However, we do know that the current flat-roof, metal-walled 13 X 13-foot structure replaced an earlier wooden one with a peaked roof sometime after 1928. 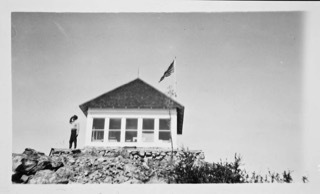 We also know that it was still staffed as late as 1989, when The Los Angeles Times interviewed lookout Soaring Jenkins, who played her harp while watching over the Santa Lucia Range. Jenkins described how drinking water was transported up the steep trail by mule once a month. 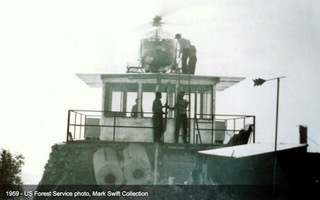 The structure now houses radio equipment and cannot be re-activated for lookout duty.